fussy eaters in mind so you can even serve up low carb meals to your family and friends and they won’t even realise it’s your ‘diet’ food – I promise. This ‘pop-up’ book means no more having to wedge your recipe book open or covering it in food as you try to find the right page! I have designed it specifically so you can stand it up on your kitchen worktop as you follow the recipe. These recipes are so easy and so delicious. Great little purchase! Love this book! Lots of tasty treats to make and all low Carb! Perfect! Thanks so much for your feedback Kayleigh. 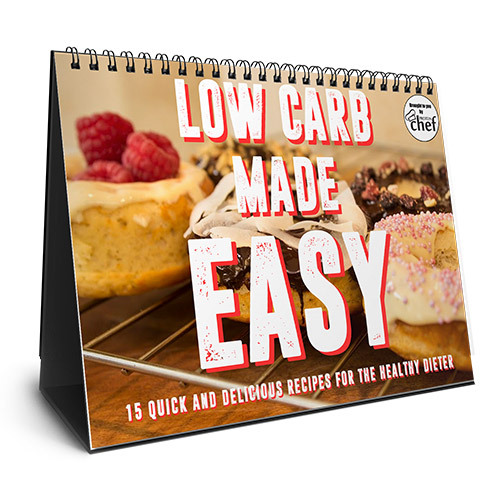 I’m so please you’re enjoying Low Carb Made Easy! Lovely tasty recipes which satisfy the “carb” cravings wonderfully. Great format for using in the kitchen! Really tasty recipes that you’ll want to use again and again – all with a low-carb halo too! My new bible…Fantastic recipies in a handy pop up book which is a super cool idea for someone like me who likes to cook in a organised kitchen. Cannot wait to try the low carb hash browns. Highly recomend this book. I’m currently on a low carb diet and I use this book most days. It offers great variety and really makes you see foods in a different light. Highly recommended.